This is the second of five articles at The Book Chook related to Children’s Book Week in 2015. The first was Activities for Children’s Book Week 2015. Next is Children’s Book Week 2015 - Ideas for Performance, Children’s Book Week 2015 - Ideas for Display, and Guest School Visits in Children’s Book Week. You might also like to browse through ideas in Activities for Children’s Book Week 2014 and Last Minute Ideas for Children’s Book Week 2014. * What books have lit up your life? Gather the titles together and use a word cloud generator like Wordle, ABCya World Cloud or Tagxedo to generate a cloud of those books. Remember to put a tilde (~) between each word to keep the words in a title together. * Think about the kinds of fiction books that light up your life. What do these books have in common? What is most important to you - plot, characters, tension, humour, language? If you had to write a recipe for a book to light up children's lives, what would it say? * Create a song for Book Week by piggybacking onto another song. Here’s a great example from Nashville Library. * Write a poem about the way books light up your life. There are wonderful poetry resources and tips for kids at The Poem Farm to help get you started. * Draw a design for a Rube Goldberg machine that incorporates both light and books. Can you think of a way to create a 3D version of your machine? This video has some ideas if you want inspiration. So does this OK Go video. 1. Video yourself and your friends acting out a favourite scene from the book, and put extra information in the video credits e.g. title, author, illustrator, publisher, location in the library etc. You can use software like iMovie and Moviemaker to edit your movie. 2. Use a collage of words and images to capture the essence of what a book means to you, and make this into a poster to tell others about your chosen book. 3. Write a speech from a character from your chosen book. Have that character tell about the book from her/his point of view. Use a tool like Voki or Blabberize to present your information. You can embed this on a class blog if you have one. 4. Use a template like those in Comic Life software, your own art work or photos, and speech bubbles to tell about your chosen book. 5. Create an alternate book cover for your chosen book. You can use Read Write Think’s interactive Book Cover Creator to set it up if you like. * Create a paper cutout inside a cardboard cylinder that shows someone reading. Add backlighting to the roll(s) to make a beautiful and eye-catching display! See samples here. * How many compound words can you write in two minutes that contain the word “light”? 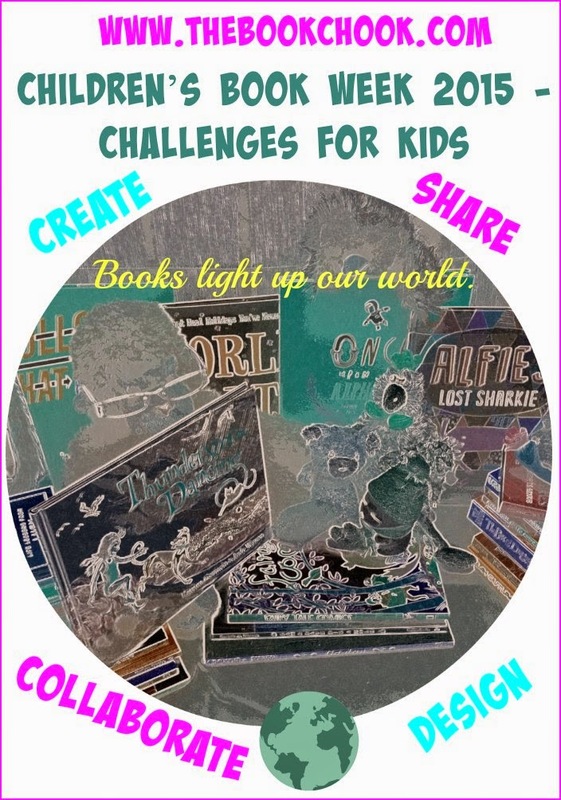 * What challenges related to books can you create for your friends?